With the arrival of 2017, the thought of fresh starts, new beginnings, and resolutions begin to cross our minds. New Year’s brings a time of reflection, self-evaluation, and opportunity. But, as strong as our self-reflection may be in the month of January, we tend to lose track of all the effort we put towards bettering ourselves as the year goes on. According to Statistic Brain, only 8% (!) of people successfully achieve their resolution each year. 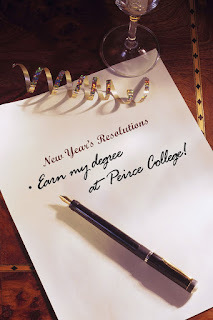 At Peirce College, we want to help encourage you to be your best self every day, no matter what month it is. Below are some tips on how to keep those resolutions going year-round from Meryl Silver, an Academic Advisor in our Walker Center for Academic Excellence. 1. Keep it Simple and Real!! Review the various areas of your life and think about what’s working and what isn’t. Don’t pick the same resolutions that you can never seem to keep. Pick something small and achievable that you know needs improvement rather than radical change. Choose carefully and concentrate on resolutions that will have the greatest impact on your fulfillment. For example, setting up two study sessions/tutoring appointments for specific hours each week to focus on your coursework will obviously improve your grades – but it’ll also give you a sense of pride and personal happiness! 2. Use a buddy system!! Tell a friend, family member or classmate whom you trust about your resolution. This buddy will be able to support you and check back with you on your goal. If you begin to waver, their support will help keep you from giving up, just in case you feel like quitting. If the two of you are striving for similar goals, you’ll be helping each other through the same experiences and concerns. In fact, you’ll be boosting each others’ resolutions! Have a weekly “check in” with your buddy and report to each other what you’ve accomplished in that time. You’ll feel focused and more successful. 3. Say it loud and proud!! Be sure to use positive language rather than being negative when thinking of your resolutions. For example, rather than thinking “I can’t be bothered with studying tonight,” think “I always feel so much better after I’ve set aside time and completed some studying to stay on top of my classwork.” Highlight the benefit to you; this is motivating and stops you from focusing on the negative for not doing as expected. 4. Set a weekly power time!! Mark your calendar! You can help your own success by setting aside a half an hour every Sunday evening. Use the half hour to “map” out your week ahead and to re-affirm your goal (for example, keeping up with your math homework). Look back at the previous week and recognize your small successes (such as scoring high on your math quiz that week since you were so prepared!). Look at the week ahead to know what you need to do and when. Be sure to celebrate your successes – even small ones. Just be sure that your celebration doesn’t interfere with the steps toward your goal. Now, keep going! You’ve done well by “breaking it down” to small, attainable, realistic goals. Extend the timeline of your resolution and continue to work it into your everyday routine. Stay positive with each challenge ahead! We wish you a safe and healthy journey through 2017. May it be the greatest year ever!